Since 1975, 1 August has been marked and celebrated as Yorkshire Day by locals and officials in the county. 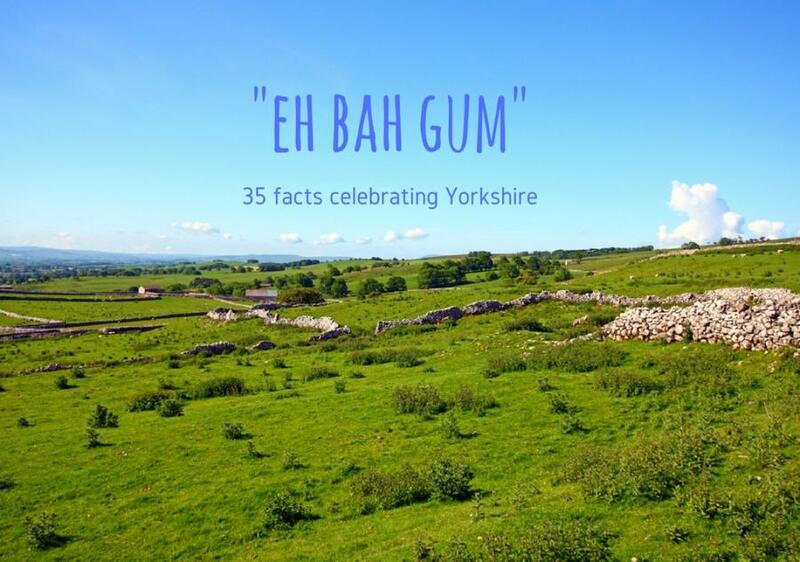 And so we bring you some random facts and trivia fodder about Yorkshire that’ll open your eyes beyond any flat cap wearing, tea drinking stereotypes. And while we’ll tell you that this is England’s largest county, it’s not until you work your way through all these factoids that you’ll understand quite what a productive county this has been over the centuries and why there are so many people proud of their Yorkshire heritage. The first Yorkshire Day was held as a protest against the previous year’s implementation of the Local Government Act 1972 that changed Yorkshire and its Riding into three separate counties: North Yorkshire, South Yorkshire and West Yorkshire. Yorkshire Day coincides with Minden Day, a memorial day for the regiments who fought in the Battle of Minden in 1759, which included King’s Own Yorkshire Light Infantry. Now part of the Rifles the regiment recognises this day by wearing white Yorkshire roses in their caps in recognition of the roses picked by soldiers en route to the battle. 1 August is also the anniversary of the emancipation of slaves in the British Empire, campaigned for by Yorkshire MP William Wilberforce. There’s a size thing going on. The ancient walls surrounding the city of York are England’s longest city wall at 3 miles in length. York’s Gothic York Minster cathedral is the largest of its kind in northern Europe. The city of Ripon is Britain’s oldest city having been granted a charter in 886 by King Alfred the Great. Powerful Yorkshiremen have long played a part in England’s history. Perhaps most notably in the civil war between the House of Yorkshire and the House of Lancaster in the late 15th century, which determined the next king of England. It was Henry Tudor, of the House of Lancaster, who defeated Richard of York to be crowned Henry VII and found the Tudor dynasty. There were three districts of Yorkshire known as The Ridings (North Riding, East Riding, West Riding) that met at the city of York’s walls. They got their name from the Old Norse ‘thridding’, which means a third and were the foundation for the county reorganisation in the 1970s. Yorkshire’s boundaries stretch from the North Sea on the east coast, taking in Scarborough and the North York Moors National Park, dipping a northern toe into the North Pennines AONB, sidling down its western border to take in the Yorkshire Dales National Park, skimming across the north-western edge of the Peak District National Park taking in Sheffield before skirting back up to Hull and the northern edge of the Humber. There are lots of sheep. Bradford became known as the wool capital of the world for its role in the industrial revolution. Meanwhile the monks of Rievaulx Abbey farmed thousands of sheep on the Yorkshire Moors and became rich selling the wool to Europe. Rhubarb, rhubarb, rhubarb. No, seriously. Yorkshire forced rhubarb was first grown in the area in the 1870s and in 2010 it was awarded the EU’s Protected Designation of Origin classification after years of campaigning to protect the species and the activity surrounding its production. The Rhubarb Triangle reaches from Wakefield to Morley and then Rothwell and is home to 12 dedicated rhubarb growers. Now everybody wants one. That same protected status is being campaigned for on behalf of Yorkshire puddings – there’s even a National Yorkshire Pudding Day celebrated on 3 February. Time for tea. In July 2016, Buzzfeed UK awarded Yorkshire Tea the accolade of ‘God tier’ in a ranking of teas it had tried and tested. Meanwhile York has plentiful options for afternoon tea. Cheers! Beer is also a bit of a thing in Yorkshire with over 80 real ale breweries making the county their home. Oh it’s also home to ginger beer and ginger ale. Sweet tooth? We have Pontefract to thank for the creation of a type of liquorice with a certain sweetness about it. Industry fact: food and drink businesses in Yorkshire and Humber contribute £1.7 billion to the local economy. Where legends are made. What we now know as Manchester United Football Club was, until 1878, Newton Heath Lancashire And Yorkshire Railway Football Club. No ducks around here. Yorkshire County Cricket Club was found more than 150 years ago and has produced the greatest number of international players for the England cricket team. They’ve also won the County Championship a record 33 times (at the time of writing). Sir Leonard Hutton, Geoffrey Boycott, Fred Trueman and Freddie Flintoff are some of Yorkshire’s most famous cricketers. Yorkshire’s medal winning Olympians in 2012 were heptathlete Jessica Ennis from Sheffield, brothers Alistair and Jonathan Brownlee of Leeds, horse eventer Nicola Wilson from Morton-on-Swale near Northallerton, cyclists Ed Clancy from Huddersfield and Lizzie Armistead from Otley, boxers Luke Campbell from Hull and Nicola Adams from Leeds, and rowers Andrew Triggs Hodge from Hebden, Katherine Copeland from Stokesley and Tom Ransley from York. Ahead of the 2016 Rio Olympics Yorkshire’s sporting prowess retains a prominent presence most notably in the British diving team: four were born in Yorkshire and two are based in Leeds – there’s only 11 squad members. Local celeb, farmer and liver of the simple life, Hannah Hauxwell, was discovered living life without a hint of mod cons in her off-grid barn in Baldersdale, North Yorkshire. She became a national star as a result of a TV documentary or two and is now living a more comfortable life nearby. She celebrates her 90th birthday on Yorkshire Day 2016. The great explorer and Royal Navy captain, Captain Cook, who is said to have discovered lands as far away as Hawaii, was from the village of Marton. Yorkshire, specifically Haworth, is Bronte Country in honour of the literary works of Charlotte Bronte (Jane Eyre), Emily Bronte (Wuthering Heights) and Anne Bronte (The Tenant of Wildfell Hall), the sisters who lived in this part of Yorkshire with their father who was the rector of Haworth. The original fireworks champion, Guy Fawkes, hailed from the city of York. Our greatest TV gardener, Alan Titchmarsh, is a proud Yorkshireman as is George Russell, known for his love of lupins. Doncaster’s Marmite personality is fast car man Jeremy Clarkson. Whether you leave the lid up or down, you’ll be grateful to Yorkshire for the birth of Thomas Crapper the maker of the modern loo. The popular folk song On Ilkla Moor Baht ‘at is known as Yorkshire’s anthem and translates to mean On Ilkley Moor without a hat. At 21:00 hours every evening in Ripon, the Ripon Hornblower blows a horn towards the obelisk in the centre of the market square. This tradition of ‘setting the watch’ dates back more than 1,100 years. Scarborough was heralded England’s first seaside resort back in the 17th century upon discovery of a spring that was thought to have health-giving properties. So whatever you think of Scarborough, it’s been popular for ever and ever. So while we continue our mission to get the nation to rediscover Scarborough we leave you also with a revived love for all things Yorkshire. Eh bah gum!